Get Your Ad In Today! ATTENTION: Classified advertisers... We can not "unprint" your ad. When you run an ad in COS it WILL get seen by more people than anything in central Oregon. So although your item may sell the first day, your ad is out until the next issue. Please accept our apology for your success and remember; too many people seeing your ad is always better than none. 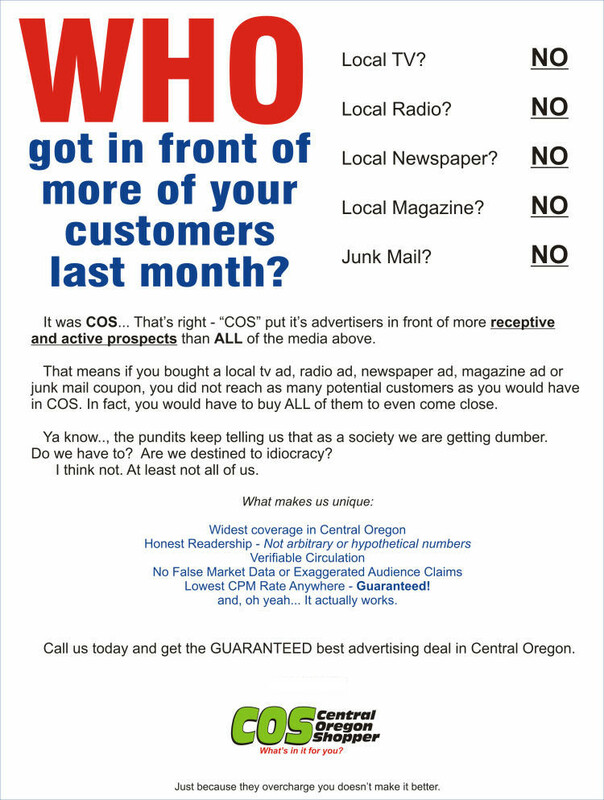 COS readers are the best in Central Oregon! WOW! Did you know you can get full color display advertising for as little as $7.67 a week. Even those cheesy little black and white things cost more than that. Did you know you can add a picture to your classified ads? Sure can! Just go to COSBEND.com it's FAST and EASY! Win some CASH and the COS SWAG BAG! HERE Central Oregon's jumbled word game. Help! I need your listing. My listings are selling! Prices are on the rise again with less bank owned property's on the market. I have been helping people sell their homes in central Oregon for 20 years. Since I actively market my listings using COS, the very best advertising available in central Oregon, I have an abundance of buyers. Call me today for a free Comparative Market Analysis (CMA) 541-280-6033 Patsy Owens, Principal Broker Remax Out West Realty. Are you looking for a realtor in central Oregon? Look here. A realtor who does little more than spam craigslist is probably not your best choice to sell your home. Realtors that advertise in the COS actively promote your property in the most effective resource in central Oregon.